WASHINGTON, D.C. — On the 60th anniversary of Rosa Parks refusing to sit in the back of the bus, The Jack Kemp Foundation today announced that Speaker Paul Ryan and U.S. Senator Tim Scott will discuss poverty solutions with former Florida Governor Jeb Bush, retired neurosurgeon Dr. Ben Carson, New Jersey Governor Chris Christie, business leader Carly Fiorina, Ohio Governor John Kasich and Florida Senator Marco Rubio who have confirmed their participation in the Kemp Forum on Expanding Opportunity in January. The forum, sponsored by Opportunity Lives and in partnership with the American Enterprise Institute (AEI) and the Economic Innovation Group (EIG), will convene these and other presidential candidates, scholars and community leaders to present and discuss their ideas for fighting poverty and expanding opportunity in America on the eve of an historic election. Speaker Paul Ryan and Senator Tim Scott will moderate the half-day conference on January 9, 2016, at the Columbia (South Carolina) Convention Center. "There are few challenges tougher than the fight against poverty, and we need all hands on deck," said Speaker Ryan. "I'm looking forward to exploring ideas about how we can expand opportunity in America." "The Kemp Foundation, Speaker Ryan and I all share the same goal of helping those most in need, and the Kemp Forum on Expanding Opportunity will provide our candidates with a great forum to articulate their plans to help all Americans achieve their dreams,” said Senator Scott. “Our nation is one of endless opportunity, and I look forward to welcoming the 2016 presidential candidates to South Carolina for this important event." “We are proud to sponsor a much-needed conversation in this primary season about policies that provide upward mobility and a path toward a comeback, for our nation as well as the millions who have been unable to escape poverty, addiction, and hopelessness. At Opportunity Lives, we highlight those solutions in our news coverage every day, which is why we are thrilled to see where the candidates stand at the Kemp Forum,” said John Hart, editor in chief of Opportunity Lives. "We have a monumental opportunity in America to change our approach to poverty—to stop treating vulnerable people as liabilities to manage and start treating them like assets to develop. AEI is pleased to partner with moderators Speaker Ryan and Senator Scott and the Kemp Foundation to hear how the candidates plan to deploy conservative ideas in this great cause,” said Arthur Brooks, President of AEI. "EIG is proud to partner with the Kemp Foundation in this important and timely candidate forum moderated by Speaker Ryan and Senator Scott. As a nation, our policies must do more to ensure all Americans - regardless of zip code - have access to economic opportunity," said Steve Glickman, co-founder and Executive Director for EIG. The portion of the Kemp Forum featuring presidential candidates is designed to be a civil dialogue between the moderators and the candidates individually, and not designed for presidential candidate interaction with other presidential candidates. The Jack Kemp Foundation is a nonprofit, tax-exempt entity organized under section 501(c)(3) of the Internal Revenue Code (IRC). The Jack Kemp Foundation engages only in educational activities and does not engage in any lobbying or political activity as those terms are defined by the IRC. Contributions to the Jack Kemp Foundation are deductible to the donor to the extent allowed by law. 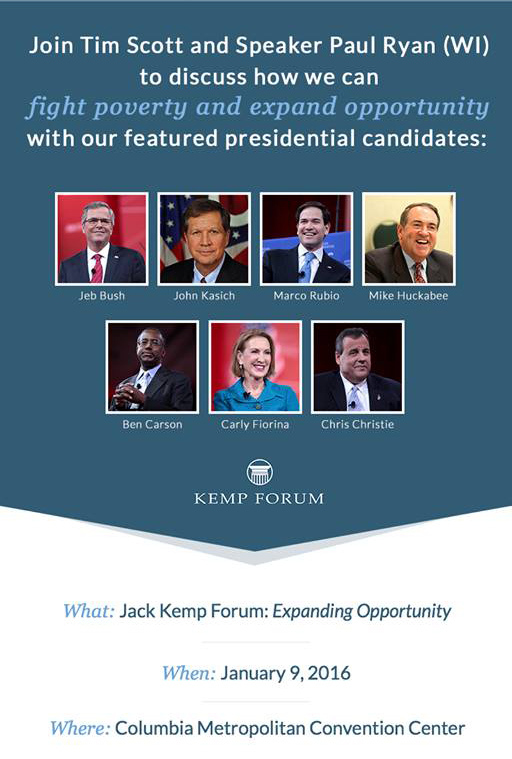 WASHINGTON, D.C. — On Jan. 9, 2016, the Jack Kemp Foundation will welcome presidential candidates, scholars and community leaders to the Kemp Forum on Expanding Opportunity to present and discuss their ideas for fighting poverty and expanding opportunity in America. U.S. House Ways and Means Committee Chairman Paul Ryan and U.S. Sen. Tim Scott will moderate the half-day conference on Jan. 9, 2016, at the Columbia (South Carolina) Convention Center. "There are few challenges tougher than the fight against poverty, and we need all hands on deck," said Rep. Ryan. "I'm looking forward to exploring ideas about how we can expand opportunity in America." "The Kemp Foundation, Chairman Ryan and I all share the same goal of helping those most in need, and the Kemp Forum on Expanding Opportunity will provide our candidates with a great forum to articulate their plans to help all Americans achieve their dreams,” Sen. Scott said. “Our nation is one of endless opportunity, and I look forward to welcoming the 2016 presidential candidates to South Carolina for this important event." The Kemp Forum on Expanding Opportunity promises to be a revealing encounter among talented men and women who would serve as President of the United States. All declared presidential candidates have been invited to participate in the educational event alongside policymakers, scholars and community leaders. A full roster of attendees will be announced at a later date. Columbia, S.C.– On the eve of the Kemp Forum on Expanding Opportunity, Bread for the World is urging Republican presidential candidates to ensure that safety net programs and policies that promote opportunity are a part of their plans to address poverty. Bread for the World is a sponsor of the forum. The forum will bring together seven Republican presidential candidates to articulate their plans to offer greater opportunity to those struggling to move out of poverty. In South Carolina, 1 out of every 7 households struggles to put food on the table. Approximately 845,000 people live in poverty – including nearly 1 in 4 children. Nationwide, more than 48 million Americans struggle to put food on the table. Bread for the World, a bipartisan Christian organization, is working to elect leaders to office who will change U.S. national priorities so that the next president and Congress put the government on track to end hunger in our country and around the world by 2030. It is not endorsing any political candidates. Resources on the 2016 elections for people of faith are available at www.bread.org/elections.